Fred Ralph Anson, resident of Ponca City, Oklahoma, passed away November 16, 2018, in Ponca City. He was 66 years old. A service to gratefully remember his life will be held at 2 p.m. on Monday, November 26, 2018, at the Trout Funeral Home Chapel with Tom Howard officiating. Burial will follow at Resthaven Memorial Park. Fred's family will be available to greet friends at the funeral home on Sunday, November 25, 2018 from 2:00 to 3:00 pm. Arrangements are under the direction of Trout Funeral Home & Crematory. Fred was born on April 30, 1952 to Howard and Esther Anson in Ponca City, Oklahoma. 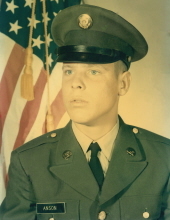 He was raised in Ponca City, and faithfully served in the US Army in Vietnam as a mechanic. After retiring from the Army, he worked at Modern Inv. Casting Co. He loved to cook for his family and especially loved trying new recipes. In his spare time, he loved to go fishing. Fred is survived by his sister, Patricia Harvey of Ponca City, brother, David Anson and wife, Tammie of Ponca City, brother, Herman Anson of Stillwater, numerous nieces and nephews, and great-nieces and nephews. He was preceded in death by his parents and his brother, Frank Anson. To send flowers or a remembrance gift to the family of Fred Anson, please visit our Tribute Store. "Email Address" would like to share the life celebration of Fred Anson. Click on the "link" to go to share a favorite memory or leave a condolence message for the family.